Anna Dressed in Blood - A book review and part of the 2015 Witches & Witchcraft Reading Challenge! 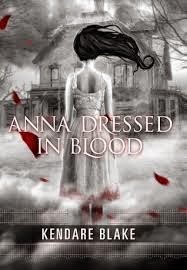 Anna Dressed in Blood is a young adult urban fantasy book by Kendare Blake. The story follows Cas, a teenage ghost killer who roams the country with his witch mother dispatching murderous spirits. Cas uses his father’s athame, a mystical blade that can cut and kill ghosts. He and his mother (his father was killed by a ghost) move from town to town knocking of vengeful spirits who are murdering the living. Cas and his mom move to Thunder Bay, a small city where the ghost of a teenage kill named Anna Dressed in Blood has been committing murders. Cas will find out that there is something different about this spirit while he continues to research clues about his father's killer. I enjoyed how the story played with the relationship between Cas and the spirit he is sent to kill. The tale turns into an examination of the kill-the-monster-of-the-week trope" and asks questions such as, “What if that monster that you are killing actually has feelings?” There is also some refreshing reflection as Cas ponders his fate as a ghost killer. What kind of future does a teenage monster killer have? The world of the book was cool. It felt like the world where I grew up, only at a perpendicular angle. I had the sense that these spirits could exist in some version of my high school experience. The characters where compelling and I look forward to reading the second book in this series. Cas and his mom live the life of murder hobos. They travel from town to town and kill monsters. The only thing that they do not do is take their stuff. This book is ripe with inspiration for any urban fantasy or monster killing campaign. Any GM who has had player characters wish for magical weapons should take a good look at Cas’ athame and the role that it plays in the story. Also, the interplay that occurs between Cas and the ghost that he is hunting is prime material for any role playing session. Any GM who would like to have their players actually interact with the XP machines that the players always attack will gain some great inspiration. I think that this plot could be lifted and used in any rpg campaign where the characters hunt monsters, from hack and slash fantasy to modern paranormal hunters. When my copy of Monster of the Week comes in to my FLGS, I will be lifting this plot and running it!